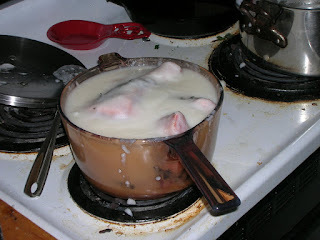 So now we have our seasoned lamb shanks on one plate and a big pot of freshly rendered pork lard in another. Now they need to go together. This was actually the hardest part of this whole process for me. I wanted a container that snugly fit all the lamb shanks together, but also one that was conservative with the amount of fat it required. A big, low casserole would fit the shanks-no problem-but would require all of my lard. Ultimately I chose an old-school rose pyrex pot that was more than happy to be back in action. This next part was easy. 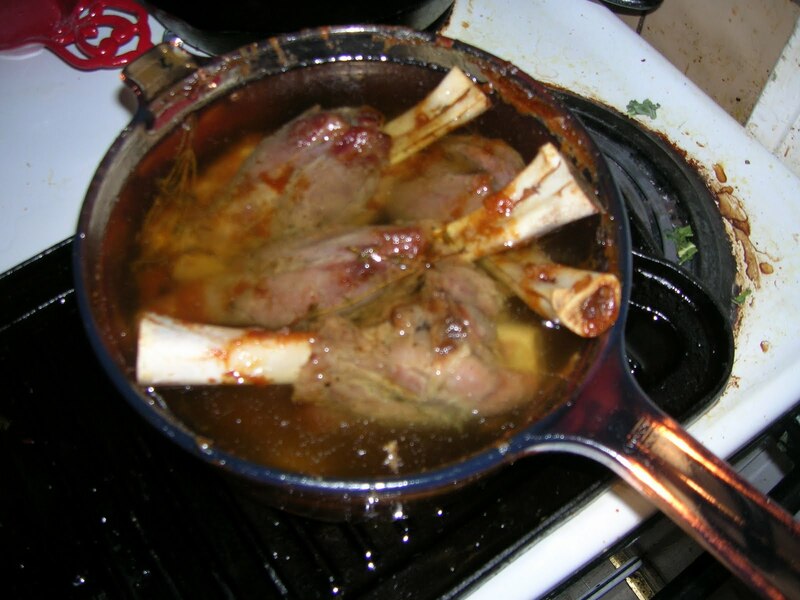 Put shanks in pot, cover in fat. Throw in the thyme and garlic that's been marinating with the lamb, too. Now comes the confit-ing! I slid the pot into a 350 F oven until all the cool fat turned transparent and began to simmer. Then it went down to 325 F after about an hour, then 300 F for the next hour, and then 275 F for the last hour. Once the pot of fat was simmering, it contained so much heat that even such a low oven temperature still kept it simmering. By this point the room had a wonderful, garlicky aroma of seared meat. I let the pot cool for about 40 min on the counter, then slid it into the fridge overnight. As it cooled, the fat contracted and exposed some tops of the lamb on the surface. 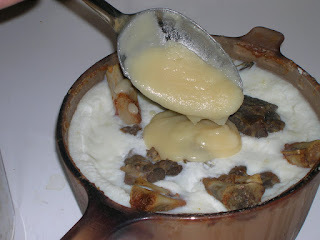 An easy enough fix; the next morning just spoon over a few ladlefulls of warm lard on top of the cooled lard. This will complete the seal and have your lamb shanks ready to mellow in the fridge for a few nights! So my plan now is to just let the shank confit hang out for a few days, then crack them out of the fat next week to serve over lentils. But more updates to come! Are these confit posts sponsored by Lipitor or Crestor? Speaking of, that's a clue on next week's secret ingredient blog post!